Biography: Matt Bowen's love for the game grew from his upbringing in the remote Cape York town of Hopevale, Queensland. With his cousin, Brenton Bowen, Matt started his junior playing career with both Souths in Townsville and playing for his school, Abergowrie College. Impressing many with his pace, agility and ability, he was duly selected in the Queensland Schoolboys in 1999, Queensland Under 19's in 2000 and the Junior Kangaroos in 2001.Bowen was signed by the North Queensland Cowboys in his teens and made his first grade debut on February 17, 2001 against state rivals the Brisbane Broncos at Dairy Farmers Stadium. Bowen has topped the try-scorers list in the NRL twice, in 2006 and 2007, and has been picked to play for the Queensland Maroons and Australian Rugby League team several times in his prestigious career. 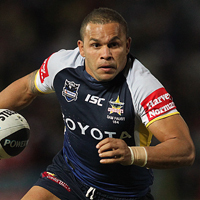 In 2008, Bowen was forced to undergo major knee surgery and returned to play for the Cowboys in 2009. Injury plagued Bowen again and he had to have another knee operation on his other leg, which put him out of action until Round 9 of the 2010 NRL season. At the beginning of the 2011 NRL season, Bowen broke Paul Bowman’s record for the most first grade games played for the North Queensland Cowboys, when he played his 204th game against the Parramatta Eels.